​Through the study of the Atlantic sea floor ridge and sea floor spreading, (a process where magma pushes up through the Earth’s crust, usually on fault lines and solidifies and hardens then repeats) we find that over time there are magnetic anomalies recorded in bands caused by the fixed magnetic polarity of the Earth at the time of solidification of the magma. 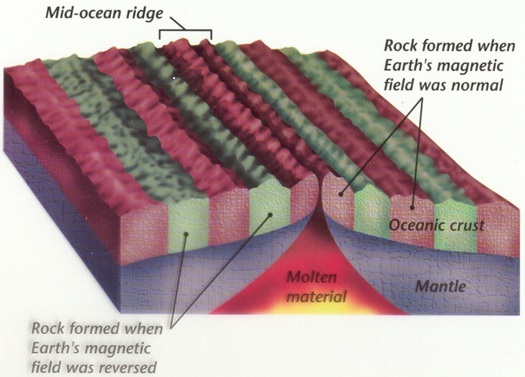 By measuring the rate of spreading of the Atlantic ridge we are able to work out when the Earth had a normal polarity or a reversed polarity and roughly when it changed and how often it changed in the past, the magnetic anomaly that causes these bands are related to tiny magnetic minerals that are aligned to the magnetic field of the Earth within the magma and freezes in their directions when the magma sets or hardens on cooling down, so by calculating the time of the rate of spread in each band we can work out how long ago each band reversed polarity. We have established a geomagnetic time scale that shows many reversals over 600 million years into the Earth’s past. Although these reversals happen randomly, most bands seem to show that on average the Earth goes through a reversal every 350.000 years or so. 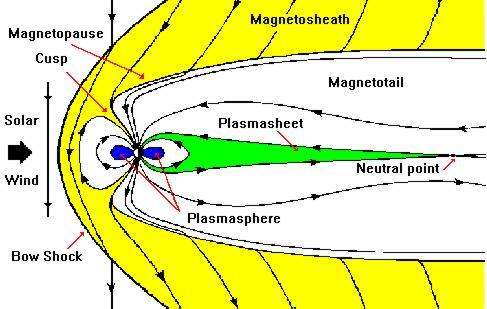 ​No one has yet worked out for sure what causes the Earth to go through a geomagnetic reversal, despite complex computer modelling being successful at recreating a reversal and laboratory experiments using molten fluid to simulate a reversal, none have proven conclusive as to accurately say 100% that this is how the magnetic dynamo works and this is why it sets up the circumstances for a reversal, the simple reason for this is what generates the magnetic anomaly takes place deep below our feet, and as we cannot see it and study it in real time we have only best guesses and theories/ hypotheses on what the magneto/ dynamo is and how it works. Maybe the European Space Agency’s SWARM mission will help us better understand this process with its three satellites monitoring the magnetic anomalies that take place over the course of SWARMS mission life span.